We're down to the Elite 8 as readers decide which was their favorite defensive play of the year. 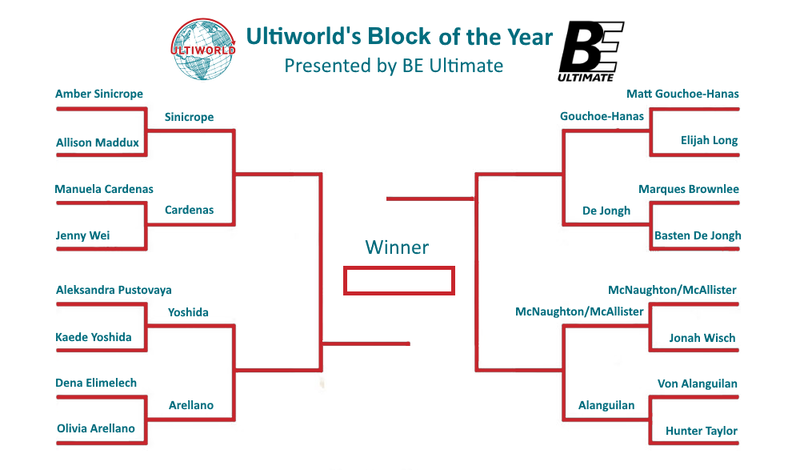 Ultiworld’s 2018 Block of the Year bracket is presented by BE Ultimate; all opinions are those of the author. Please support the brands that make Ultiworld possible and shop at BE! Round 1 of our Block of the Year bracket is in the books and we’re left with quite the international collection moving on —five different nationalities are represented1 in the final eight contenders. How many will remain after the next round of voting? Quarterfinals, here we come! Voting for Round 2 will be open through the long weekend, closing on Tuesday, January 22, at 3:00 PM Eastern. An early crowd favorite (if Twitter is to be believed), Sinicrope’s WUCC layout Callahan comfortably eased past Allison Maddux’s national semifinal chase down block in Round 1. Next up for the Brute Squad captain is a dance with perennial contender Manuela Cardenas. Cardenas is now seeking her third consecutive appearance in the semifinals of our Block of the Year brackets. Will we ever grow weary of watching this woman blow up opponents with her jaw-dropping athleticism? Thankfully, it seems, we haven’t desensitized ourselves to her abilities yet. In what was perhaps unsurprisingly the most voted on matchup of Round 1, Kaede Yoshida managed what no female clip was capable of last year — knocking off a Russian nominee in one of our year-end brackets. Yoshida’s incredible, out-of-nowhere block at the U24 World Championships now takes on a nominee from another young future star. Arellano survives the first round, defeating one of the most memorable blocks of the 2018 college season. The Rogue defender now takes on a much more stylistically similar nominee — utilizing pure speed to close down a seemingly uncloseable gap to deny a goal. Claiming the largest margin of victory from the first round, Matt Gouchoe-Hanas demolished his college teammate en route to the quarterfinals of this bracket. Now he takes on another high-flying catch block from international competition. Similar to his Round 2 opponent, De Jongh had no trouble in advancing in this bracket — even against (arguably) the most high-profile player in the sport. The impressiveness of going cleanly up and over his Philippine mark for this block is matched only by how cleanly De Jongh managed the feat. While there was some debate about the appropriateness of including this clip — which, in the end, resulted in a relatively routine catch block — our readers decided the quality of the pull from McNaughton was enough to beat out Wisch’s solo point-block-to-Callahan block. Will they be so generous in Round 2 against one of the finest layouts from the Club Championships? After falling behind early in the first round matchup, Von Alanguilan’s full-extension, finger-tip block —the signature highlight among a tournament full of impressive blocks from the Machine star — came back to defeat Hunter Taylor’s acrobatic, contortionist entry. Can the Men’s Club Defensive Player of the Year march on to the semifinals? Comments on "Ultiworld’s 2018 Block Of The Year Bracket: Round 2, Presented By BE Ultimate"